Mercedes has a problem. The 2013 Mercedes-Benz SL is a volume tourer for the brand, but when someone becomes aware the SLS AMG exists they suddenly find it hard to find the SL interesting. It's the same reason you don't see many movies starring both Tobey Maguire and Terry Crews. BRABUS hasn't made the SL look any better — you could argue they've done the opposite — but they have injected it with some Crews-like muscle. When touched up by BRABUS, power from the SL500's 4.4-liter biturbo V8 puts out 520 horsepower, compared to the standard 435 horses, with peak torque now at 604 lb-ft. They do this with a flash, additional water-to-air intercooler, stainless steel exhaust, and a modified limited-slip to help put the power down where you'll like it. 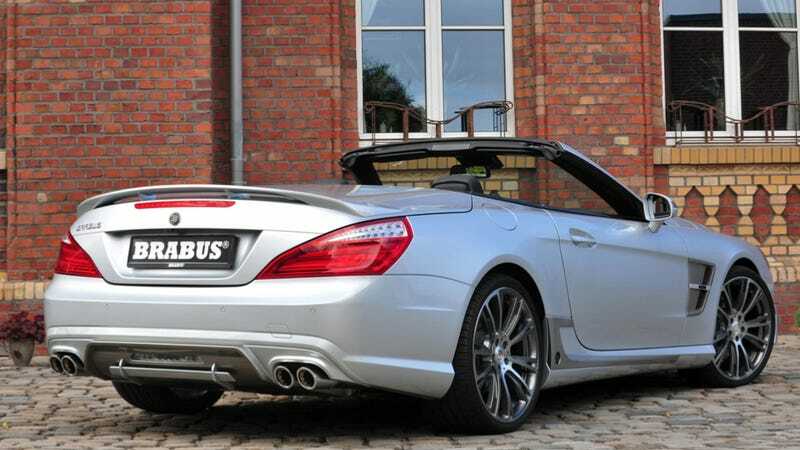 I'm not as underwhelmed by the SL's design as other critics, but the BRABUS is less an improvement and more a diversion into the suddenly less-restrained and slightly tackier language of German tuning. Look, we put a hole in the rocker panel! Vents! Big Wheels! BRABUS offers other interior tweaks and will customize your SL 350 or SL 500 with a mix of anything you'd want, including just the body kit. You know, if you want a car that looks like it'll do 60 mph in 4.4 seconds and max out at 186 mph but don't ever plan to go that fast. There's no listed price, so I'm not sure why you'd select this over the SL 65 AMG, which comes with a toupee+face-ripping 738 lb-ft of torque unless it's some sort of strange value proposition.